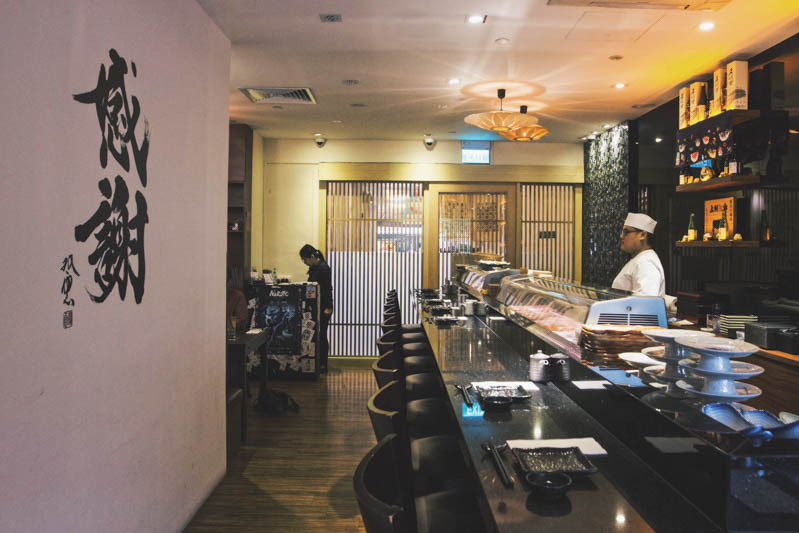 Hidden in a quiet corner of Robertson Walk among several upscale restaurants is Hinata, a Japanese restaurant specialising in fresh sushi and sashimi. Once we entered the restaurant, it was as if time slowed down. The sleek interior had an inviting and cosy vibe to it. Perfect for a respite amidst the hustle and bustle of the city. 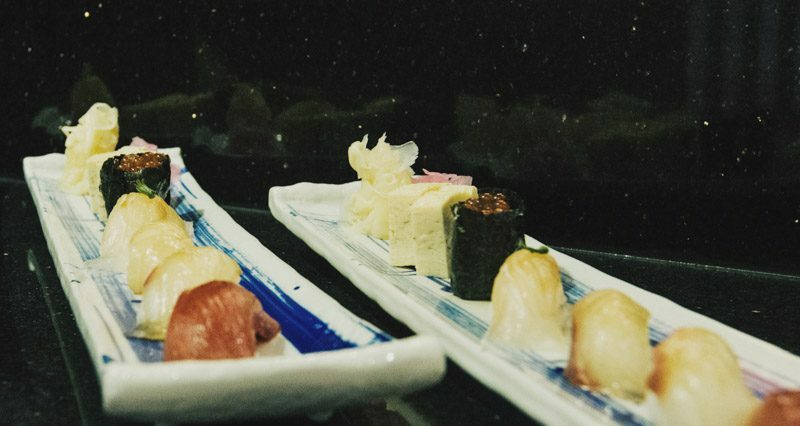 We had the luck to try its $120 Omakase Set, so here’s what we thought of it. Beginning our meal was an appetiser of Deep Fried Salmon Skin and Tuna in Teriyaki Sauce. Here, the tuna was a little dense with a nice chew to it — typical of fish with low-to-no fat content — and the teriyaki sauce did well to complement it. I only wish it was a little moister. 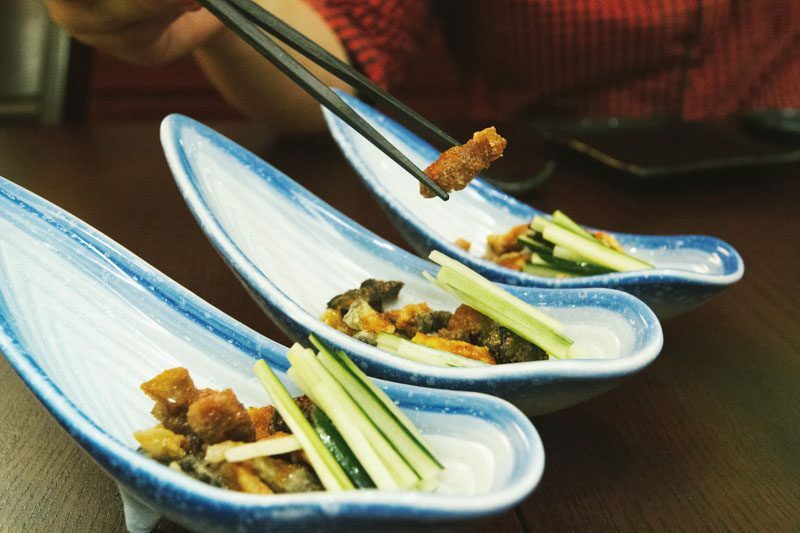 Crunchy, well-salted and fragrant with a hint of fat, we couldn’t stop reaching for piece after piece of the fried salmon skin. Commencing our meal proper was a sashimi-styled Shiro Baigai (Japanese Ivory Snail). 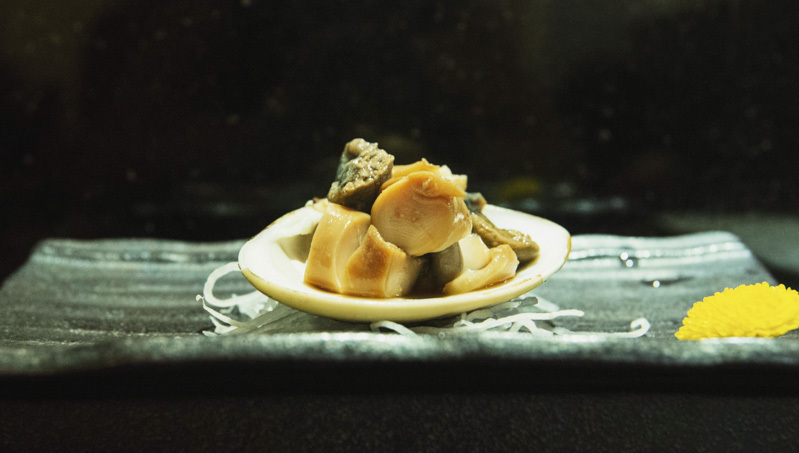 Lightly marinated in soy sauce, it yielded a tender and slightly chewy texture, similar to abalone. Light, clean-tasting and sweet, we appreciated how the marinade allowed the snail’s sweetness to take centre stage. 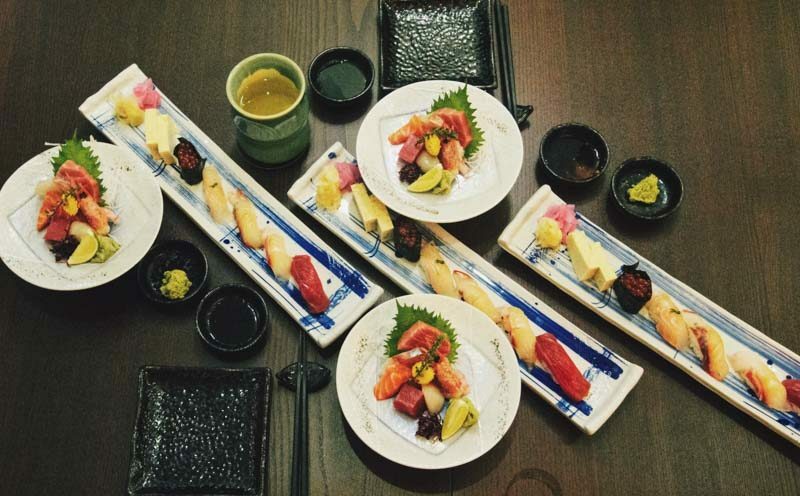 Next up was a platter of assorted sushi, which consisted of Akami (Lean Tuna), Shima Aji (Striped Horse Mackerel), Kanpachi (Greater Amberjack), Hirame (Flounder), Ikura (Salmon Roe) and Tamagoyaki (Japanese Omelette). Each piece was amazing but if I had to my favourite piece, it definitely would be the kanpachi, which was incredibly tender, buttery and practically didn’t need any chewing. A slight gripe I have here would be with the ikura gunkan, which was overly salty even by ikura standards. However, the availability of grated wasabi is always a welcome. 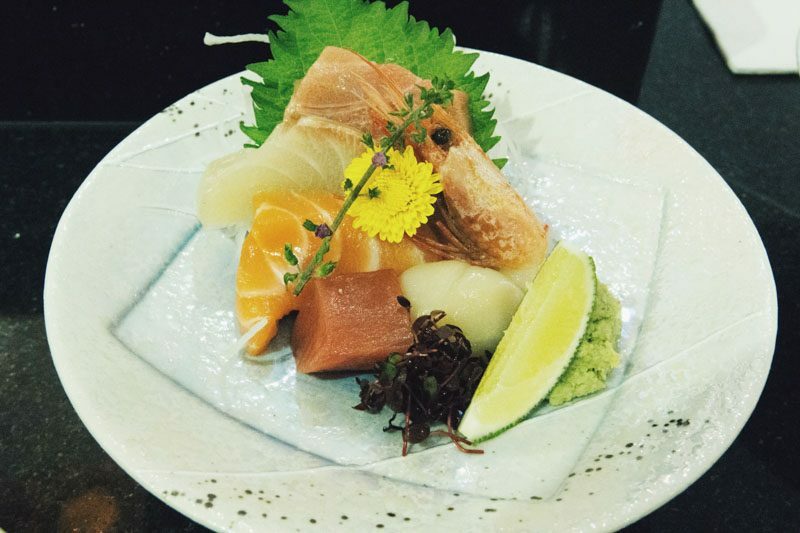 Just when I was hoping to have more sushi, a platter of sashimi arrived with a mix of repeated and new seafood, featuring a thick slice of Akami, Salmon, Ama Ebi (Sweet Prawn), Shima Aji and Chutoro (Medium-fatty Tuna). This time, the chutoro stole the limelight from the kanpachi as my favourite piece with its smooth and melt-in-your-mouth texture from its marbling. For the sashimi, the helpful waitress recommended to us the unique approach of infusing the shoyu with the hojiso, akame leaves (both varieties of mint) and chrysanthemum before using the flower as brush for the soy sauce. Finally, we departed from the raw fish courses with a Seasonal Grilled Fish. The choice of the day was shima aji but it changes every few weeks so do check ahead if there’s specific fish you’re looking for. Grilled to a light crisp, the lightly-salted skin was absolutely delightful. The flesh itself was flaky but a little bit too dry as a result of the fish’s lack of fat. 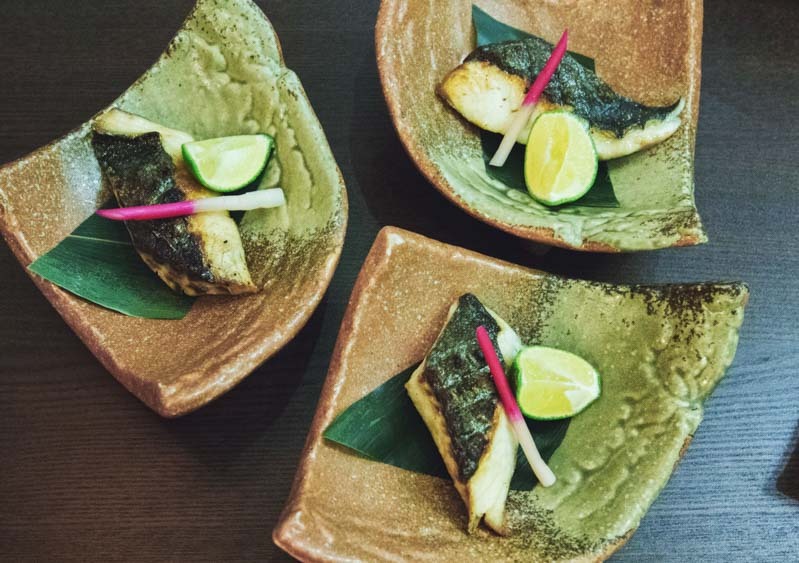 A squeeze of sudachi (Japanese lime) — it’s less zesty and sharp compared to lemon — helped immensely in redeeming the dish. For our mushimono (steamed course), we were served Uni Chawanmushi. 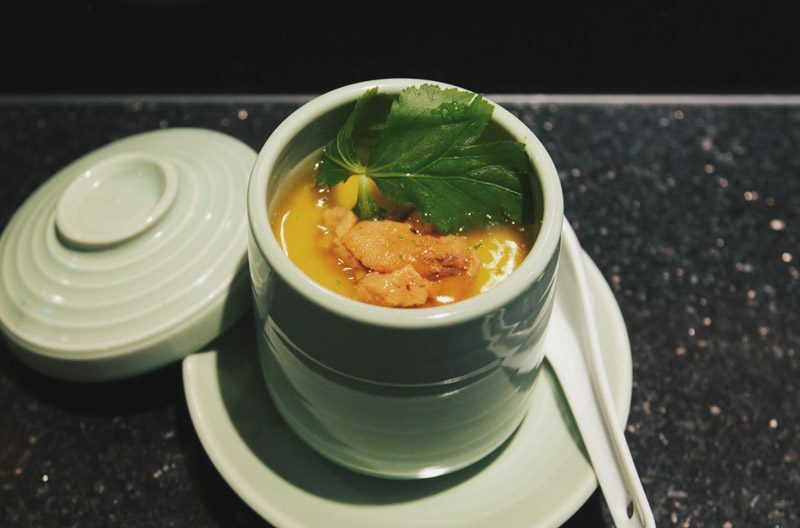 By itself, the chawanmushi was great; wobbly and smooth with a pleasant fragrance from the combination of the egg and dashi stock. However, even that couldn’t mask the overly intense briny taste of the uni (sea urchin). Perhaps, a safer protein such as zuwaigani (snow crab) would have fared better. We ended off the savoury courses was assorted Tempura, which included Botan Ebi (Spotted Sweet Shrimp), Mekochi (Flathead Fish) and Shishito (Japanese Green Pepper). 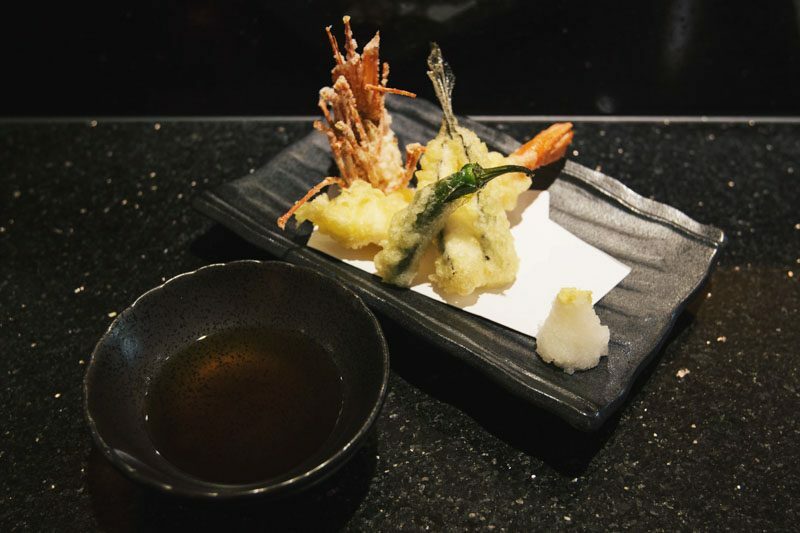 Served in two pieces, the tail portion of the botan ebi was similar to the ama ebi but denser with a more prominent crunch while being less sweet. It didn’t have much flavour on its own but went well with the tempura sauce. I’ll suggest eating the whole thing, feelers and all, to truly appreciate the botan ebi. The mekochi, on the other hand, couldn’t be saved by the tempura dip. The batter and the filet of fish was too thick and under-seasoned, a really undesirable combo. No matter how long I left it in the dip, each bite still had a noticeable lack of flavour towards the centre. 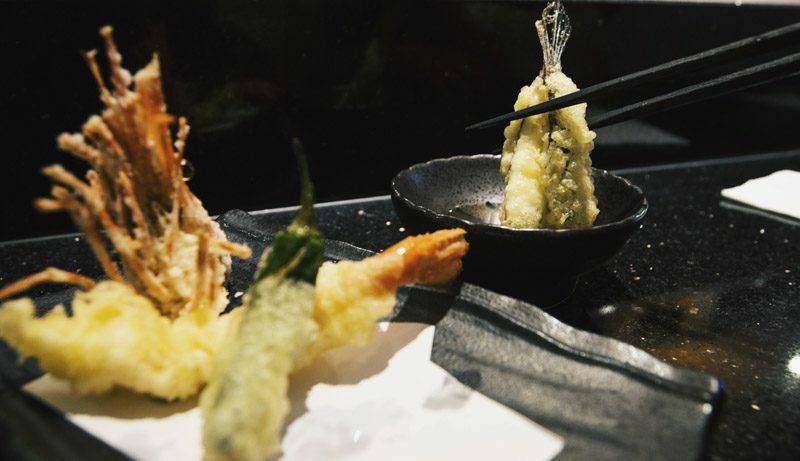 Thankfully, the tempura course was saved by the dessert course, which comprised of a slice of Japanese Musk Melon and Vanilla Mochi. 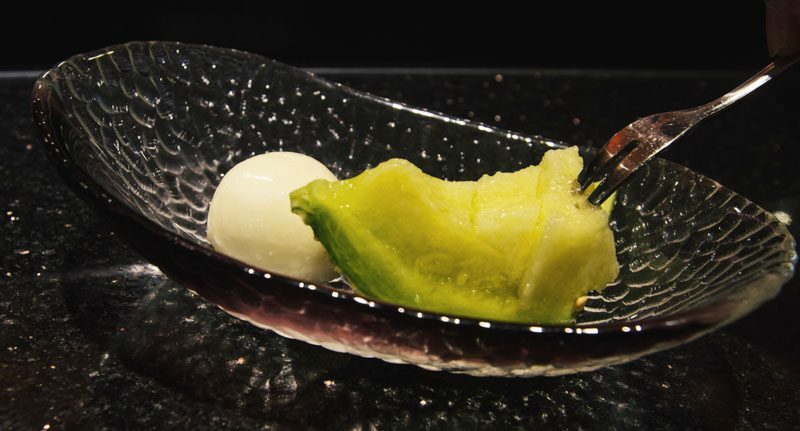 While the mochi was serviceable at best, the musk melon was a total showstopper of a dessert. Unbelievably sweet and juicy, the distinct melon-y aftertaste lingered long after each bite. 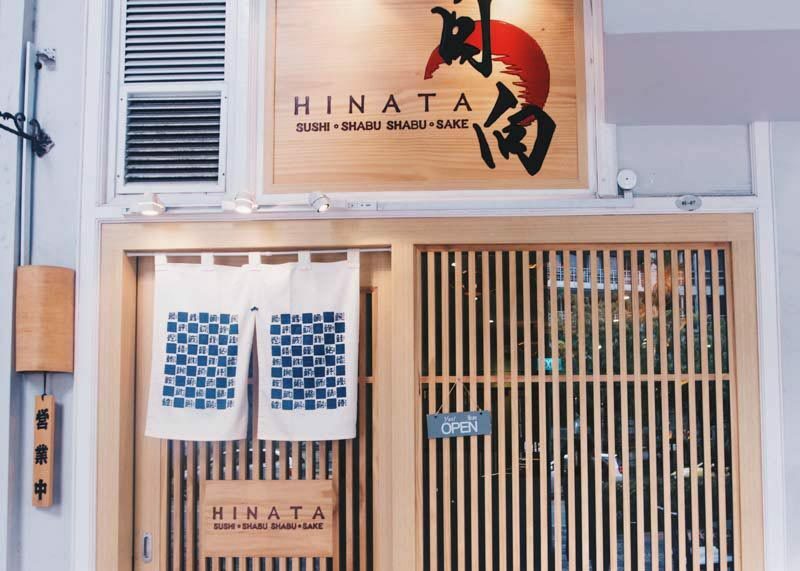 Overall, I would still recommend Hinata, but only for their sushi and sashimi offerings, which were a sheer delight to have. While the omakase course did deliver in terms of quality ingredients, the execution for the cooked dishes were unfortunately somewhat lacking. Special mention goes to the service as well, which was impeccable. The waitresses were well-versed in the names and preparation of the dishes and answered every query confidently. My glass of green tea never went below half-full throughout the entire meal. It’s always the small things like this that makes you feel taken care of, like you’re a welcome guest. I can definitely see myself returning for that amazing kanpachi alone. Compulsive menu-reader with a perpetual craving for sushi. Hates getting bamboozled by over-hyped food spots with long queues.